NOTE: This tutorial is only for VPS and Dedicated Server products. To maintain server security, clients using Personal, Business, Premium and Reseller plans do not have access to the CSF firewall. IP addresses blocked on these services can still be unblocked by logging into https://billing.digitalpacific.com.au from the blocked IP. Editing the firewall is an advanced function. Unblocking IP's is generally fine to do, but for other functions, if you're the slightest bit unsure please feel free to contact our support team. NOTE: If your IP is blocked, note down your IP (you can find it using whatismyip.com) then tether your phone's internet connection to your computer (your ISP should be able to assist with doing this). 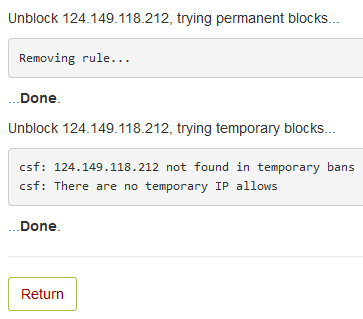 You'll now have an unblocked IP address that you can use to log into your server and unblock your main IP. WARNING: You should only ever whitelist an IP address if you have confirmed with your ISP that the IP is static and won't ever be given to any device other than your home/office router. Even then, someone accessing your local network unauthorised or a visitor/employee with access to your network will have unrestricted access to hack your server while connected to the network. If you're experiencing constant IP blocks due to failed passwords, we recommend setting a temporary IP whitelist for a few hours. Unless you have very specific technical requirements, there's never a good reason to permanently whitelist an IP. To temporarily whitelist/blacklist an IP look for the Temporary Allow/Deny option, select either allow or deny, input the IP address, select the ports (you can use * for all ports, type one port or multiple separated by commas, for example, 25,465,587), select the length you want and either press Enter or hit the Temporary Allow/Deny button. To whitelist an IP address Permanently on your server you will need to first input it in the Quick Allow section and hit Enter or the Quick Allow button. Once that's done do the same in the Quick Ignore section. First, click the Firewall Allow IPs button. 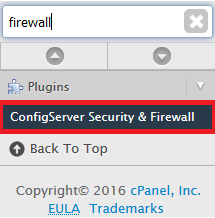 To remove a backlist click the Firewall Deny IP's button. You will see a screen similar to the one bellow. Delete the whole line where the IP is listed and Change down the bottom. Remove the IP from this list and click Change. If your server is not used for email, if SSH access isn't used or if you only want secure SSL connections used for email, you can block specific ports on your server by removing them from the default whitelist. Next, search for the TCP_IN and TCP_OUT functions. Just remove the port number from here. Before you start, note that IP address lists are large enough that using this option can potentially cause your server speed to drop, so keep a note of it for a week or two after making the change. It will also prevent any email or web traffic from countries not whitelisted. The upside, of course, is that this has a significant positive effect on your server security. One more thing, the country IP lists are about 99% correct, meaning it's 1% incorrect, so this may be an area you should look into should a client be unable to access your server. You can also apply blocks on a per cPanel account basis. Click here for a tutorial. The tutorial assumes your server has Geo_IP installed. Feel free to contact us if you're unsure. Note that this method only blocks the web ports 80 and 443. First, click on the Firewall Configuration button. To view a list of country codes, click here and look at the bottom of the page. 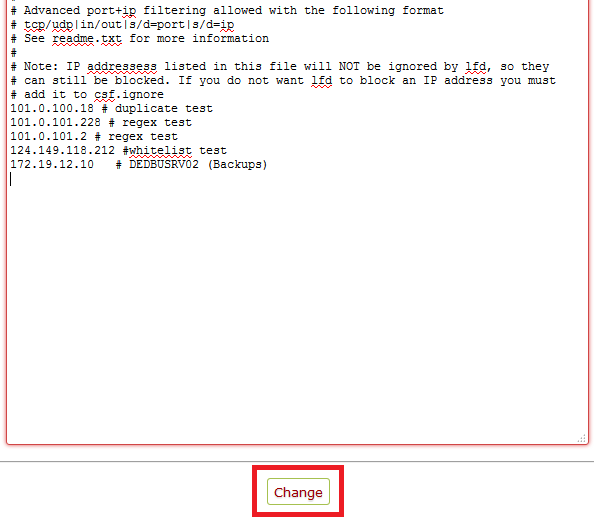 Afterwards, you will need to scroll down and enable LF_IPSET (this helps with the load on your server). Once that's done , scroll down to the bottom of the page (it's long, so you may want to drag down from the sidebar) and hit Change.